Fall in Dubai brings a gradual cooling down of summer’s heat, allowing visitors to relax and sightsee outside in warm—but not unbearably hot—weather. From desert adventures to cruises on the creek and day trips to Abu Dhabi, here are some top tips for enjoying Dubai’s late-year sunshine. Catch a hop-on hop-off bus tour to ride by Dubai’s signature sights, such as the soaring Burj Khalifa, sail-shaped Burj Al Arab hotel, and more. Bask in the evening cool and city lights on a dinner cruise on the Dubai Bateaux, a glass-enclosed boat that glides along picturesque Dubai Creek. Embark on a day trip to Abu Dhabi, the UAE capital, to admire its showpiece Sheikh Zayed Grand Mosque, gleaming Corniche, and other sights. Gaze at sharks, tropical fish, and other aquatic wonders on a behind-the-scenes or glass-bottom boat and submersible tour at the Dubai Aquarium and Underwater Zoo. Brave the world’s fastest coaster and experience a host of other auto-themed thrills at Abu Dhabi’s Ferrari World, the planet’s biggest indoor theme park. Enjoy the desert in decadent style with a luxe wildlife drive in Dubai Desert Conservation Reserve followed by a private gourmet dinner at a secluded, lantern-lit retreat among the dunes. 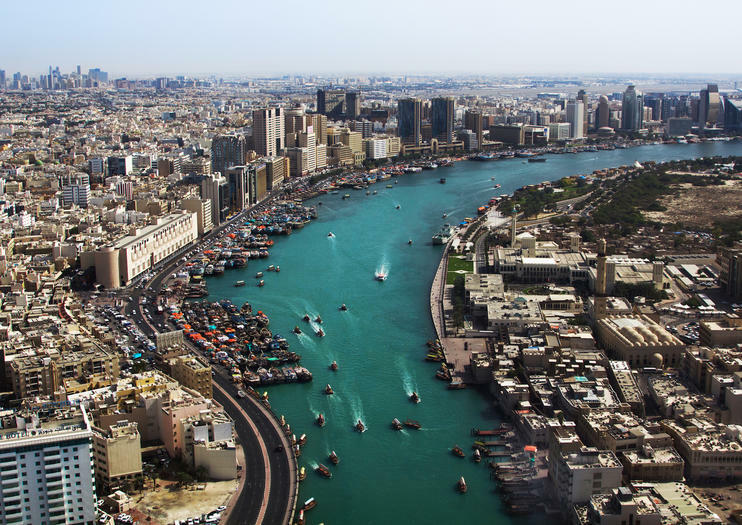 Take in the sights along Dubai Creek as you dine on this evening dinner cruise. Settle aboard the ‘Jameela,’ an Arabian wooden ‘dhow’ boat floating restaurant, and pass illuminated landmarks including the Al Maktoum Bridge and Grand Mosque. As you admire the sights, enjoy an international buffet dinner and live entertainment, and the cool breezes on the open-sided upper deck. Cruise includes a soda or house wine, plus optional upgrade to include return hotel transfers. Treat yourself to a VIP dinner-and-desert experience with this private, luxury 7-hour adventure from Dubai. Venture into the desert in a plush Range Rover 4x4, and take a thrilling wildlife drive through the Dubai Desert Conservation Reserve to look for rare Arabian oryx and other desert species. Then, after watching a stunning falconry display, ride a camel to a romantic, lamp-lit desert sanctuary and enjoy a private, gourmet 6-course dinner under the stars. Upgrade your experience to a private Range Rover and enjoy a private wildlife-spotting drive before dinner.